4.2. What you can change. 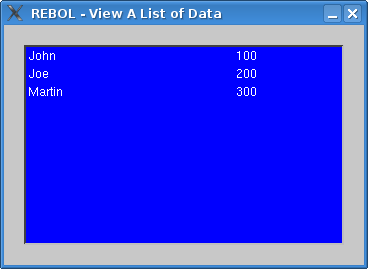 view-list.r is an introduction to the ease of gui creation with REBOL/View and the power of VID's list style. The above image was created running REBOL/View 2.7.5.4.2 GNU/Linux 4.0, KDE Desktop. This script is an introduction to the view and layout functions of REBOL/View and the list style within VID. This short example only uses the data feature of the list style. It does no justice to the power of list. It highlights the ease of use but does not show off its real power. The power comes from 'iterated' sub lists and the supply feature of the list style. The data feature of list is still pretty powerful. It accepts a block of graphical control information, for each element in the list. 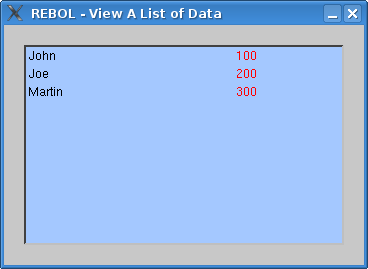 In this example, the list data is a name and a number. The list is created as a blue square 320x200 pixels in size. Inside this blue box, the list style defines a text style for the name, 200 pixels wide and white, and another text style 100 pixels wide in white for the number. Try doing that in any other programming language and 62 characters of source code.